HUNTINGTON BEACH, California (Sunday, July 29, 2007) – C.J. Hobgood (Melbourne Beach, FL) has taken the 2007 Honda U.S. Open of Surfing presented by O’Neill title today, defeating Jeremy Flores (Hossegor, FRA) in an all-elite Foster’s ASP World Tour final. After yesterday’s interruption in the last heat of round 3, what a relief it was fro everyone to get back to the beach knowing Keoni Perkins (Haw) was definitely safe. We could then start round 4 in the best conditions, some clean 3 ft waves breaking for this final day of competition of the OPT-Tahiti Pro Longboard. The three-men quarterfinals started at 8.30 AM, and Duane De Soto (Haw) faced Scott Fong Jnr (Haw) and local Heifara-Jean Tahutini (Pyf). With a similar level, the three men surfed really well, Fong using the repertoire with accuracy while De Soto and Tahutini were going vertical on the hollower lefthanders. Opening the day with an upset, Tahutini eventually eliminated Fong to advance to the man-on-man quarterfinals. “I’m stoked to make the man-on-man heats at home. Just too good to reach such a round and surf against some of the best surfers in the world,” said Tahutini. 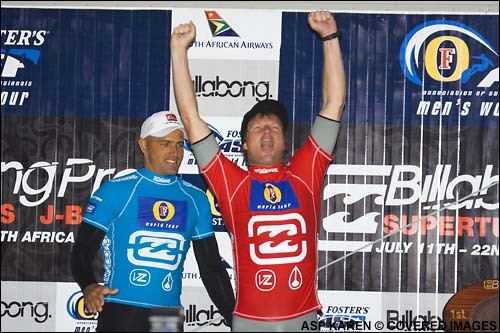 JEFFREYS BAY, South Africa (Saturday, July 21, 2007) – Australian Taj Burrow beat eight-time Foster’s ASP World Champion Kelly Slater (USA) to win the Billabong Pro Jeffreys Bay today. The victory is Burrow’s second on the 2007 Foster’s ASP World Tour and has moved him to World No. 2 on the ASP ratings. “It feels amazing!” Burrow said. “I’m so stoked to have won two events. I’ve had so many bridesmaids over the last couple of years and to get this monkey off my back, it just feels really good! We’re totally blessed in Cornwall to have awesome beaches and great waves right on our doorsteps however, for whatever reason, there are still lots of girls who have never tried the exhilarating sport of surfing. This summer top surfing brand Roxy will be opening up the waves for them and giving them a great chance to get on board as they bring a host of inspiration female surfing pros and a lot of fun to Fistral Beach in Newquay on the 1st and 2nd August. The sun may not be shining but you can still imagine yourself surfing the Cornish waves on a 1920s belly board at the National Maritime Museum Cornwall. From Wednesday July 18 the Maritime Museum in Falmouth will be redisplaying part of the acclaimed surfing exhibition that the Museum first hosted in 2005. Discover how the sport of surfing first arrived on Cornish shores and spread around the UK coastline to become the sport and industry it is today. 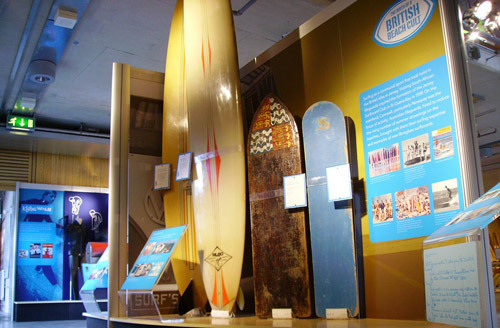 Among the boards on display is a decorated 1920s belly board from Jersey and two of the earliest British-built surfboards from the 1960s. Also, you can see how wetsuits played an important part in the progress of UK surfing and find out how boards are built today. Ben Lumby, Exhibitions manager commented: “Surfing has grown massively as a sport and it is huge in Cornwall now. But the first guys to paddle out there, right back in the early days, were doing something that was new to everyone. How surfing arrived on our shores and spread around the UK is a colourful story in itself”. This small but vibrant collection of giant surfing images and equipment through the ages will be on show until the end of September. This month we’ve had a pair of Cobian Lone Star Flip Flops sent through to review and we have to say we are pretty impressed. The material is different to the other brands we’ve had to try, it has a horse leather strap, the top sole is a soft leather on top of a shock absorbing foam midsole and the bottom is a textured grippy rubber. They are pretty comfortable although the material under the straps was a little scratchy at first that soon went away. You can tell that they are very well made and the quality materials used make them sturdy yet not too heavy to make your feet sore. They are also very stylish in a slightly unusual way, the shape is a bit more square on the front than the typical rounded flip flop design. Overall the Lone Stars are a good looking leather sandal for any occasion. They are smart enough to have you covered if you need to dress up, but still casual enough to look at home on the beach. Eric Rebiere wins 2007 Superbock Pro! 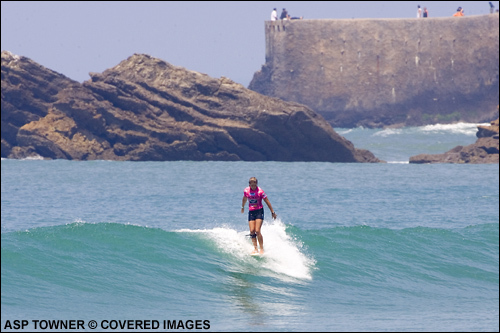 BIARRITZ, France (Sunday, July 15, 2007) – Jennifer Smith (USA) has been crowned the 2007 ASP Women’s World Longboard Champion, following her victory in the Roxy ASP WWLC in Biarritz, France this afternoon. JEFFREYS BAY, South Africa (Friday, July 13, 2007) –World No. 1 Mick Fanning (AUS) dominated day three of the Billabong Pro Jeffreys Bay much the way he’s commanded Foster’s ASP World Tour competition since winning the event last year. Fanning has finished in the quarterfinals or better in each of the 10 elite tour competitions since that victory, a feat that has positioned him as the most consistent surfer on tour the past 12 months. His 15.34 to 9.27 win over wildcard Shaun Payne (ZAF) earned him the second highest combined total of the 19 heats run today – the first, a 16.83, was posted by Joel Parkinson (AUS). JEFFREYS BAY, South Africa (Thursday, July 12, 2007) – Two of three Billabong Pro Jeffrey’s Bay wildcards are through to Round 3 after surviving Round 2 elimination today – Foster’s ASP World No. 2 Damien Hobgood (USA) was among the top seeds dispatched. Romain Cloitre & Pauline Ado win buondi pro junior to lead the ratings! The first heat of the men’s quarterfinals started at 8.45 AM in 2 to 3 ft waves, under the same clear skies we’ve been having since the beginning of the week. One of the in-form men of the event Charly Martin (Glp) surfed in heat #1 and waited for the best set before taking off to score some radical backside re-entries on the 3 ft lefthander breaking south to the judges’ tower. Young gun Maxime Huscenot was the only one of the other three men to remain close to the leader, using the same positionning to get some good potential lefthanders as well; the heat almost ended as a duel between the two surfers, Martin finishing first of this opening battle. Check the local surf reports from the best sites in your area. Check the local weather charts. Check the local surf cameras. You are currently browsing the archives for July, 2007.